Not only do students make a pretty flower, but they also practice counting and identifying numbers. Please note: this craft it challenging for younger children, as it has many steps. You might want to spread this craft out over a couple of days. 1. On a large piece of yellow construction paper, form a flower: trace a circle in the middle of the paper and nine ovals around the circle. 2. On the first petal, make one dot by dipping your child's finger into finger paint and pressing the finger onto the page. On the second petal, make two dots using the same method. Make three dots in the third petal, four dots in the fourth petal and etc. Follow these steps until you have made nine dots in the ninth petal. In the center of the flower, make 10 dots. Allow to dry. 3. Paint a piece of cardboard green and allow to dry. This will be the stem. 4. Have your child use his or her imagination and pain another piece of cardboard any way they want. This will be the pot. Allow to dry. 5. When the flower is dry, cut around the ovals with a scissor. 6. When the stem is dry, use a ruler to make straight lines and cut out the stem. When you dry the stem, make sure it is proportionate to the flower. 7. Staple the stem to the flower pot. 8. Staple the flower to the stem. 9. Have your child choose a piece of construction paper that is his or her favorite color. Use the same stencil you used to make the flower petals to make 9 loose flower petals. On a yellow piece of construction paper, trace the same circle used as the center of the flower. Cut out the petals and flower center using scissors. 10. Have your child write the numbers 1-9 on the ovals and the number 10 on the circle. 11. Make a game out of counting the dots on the flower petals and matching the corresponding numbers. We were learning about money and the children wanted a purse to carry their "money" around in. We helped them make their own wallets - with just a piece of construction paper. 1. Hold the paper in portrait orientation. Fold in half. 2. Open paper up. Fold the top corners toward the center. 3. Fold each edge toward the center. Flatten the paper. 4. Fold the bottom of the paper up, so at least 1 inch of paper overlaps with the corner of the folded edge. 5. Tuck in the inch of paper overlapping. Flatten. If you want to make the envelop more secure, glue, tape or staple the edges together so it will not come apart. Valentine’s Day is this Thursday! It’s a fun day for kids to exchange cards and indulge in sugary snacks and treats. However, those decadent treats are one of the causes of dental decay, which can have a lasting impact on your child’s overall growth and development. According to the Centers for Disease Control and Prevention (CDC), tooth decay, also called carries or cavities, is one of the most common preventable childhood diseases. It is five times more common than asthma and 28% of all children between the ages of 2 years and 5 years have dental decay in their baby teeth! Tooth decay starts at the surface of our teeth, which is protected by a coating called enamel. Bacteria called mutans streptococci produce plaque - a soft layer on the outside of the tooth that provides a home for bacterial colonies to grow. When we eat sugary food, the bacteria convert the sugar into acid that breaks down the protective enamel on our teeth. If left untreated, decay can spread to inner core of the tooth and affect the blood supply, leading to pain and infection. In young children, who do not have their adult teeth yet, cavities are a serious problem. Baby teeth are place holders for permanent teeth. If baby teeth have cavities, adult teeth might not grow in properly. This can cause life-long health problems. Tooth decay starts as soon as the baby incisors erupt – usually at around 6 months of age. Cavities can lead to persistent pain and speech problems. Healthy teeth are essential for chewing food properly. It doesn't sound like a big deal, but chewing food properly is important for optimizing our body’s ability to absorb nutrients from what we eat. The inability to chew food can lead to weight loss and undernourishment. Limiting sugary foods, which includes some fruit juices and breakfast cereals, is important for preventing cavities. When it comes to sugary food, remember how often is more important than how much. Basically, this means what causes cavities is how often you eat sugary foods – not how much you eat in one serving. This Valentine’s Day, promote dental health. Practice good oral hygiene and limit your sugary food intake to once a day. The healthier our teeth are the more we can enjoy those tasty Valentine's Day treats! New York City Department of Health and Mental Hygiene. 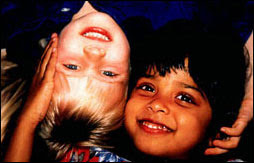 Early Childhood Oral Health (2010). American Academy of Pediatrics. Caring for Our Children, 2nd Edition (2002). Connecticut Department of Public Health. (2008) Childhood Oral Health. www.dph.state.ct.us. Make hats you can easily customize from Styrofoam plates and bowls. 1. Place a Styrofoam bowl upside down on top of an upside down Styrofoam plate. Tape together with masking tape. 2. Flip the hat over, so the plate is right side up. With a scissor, cut out a hole from the plate the same size as the bowl.